Jim, 03 Jun 2015TO ALL N9 USERS: we cant access OVI store anymore, and we cant create new account to download ... moreWhy didn't Microsoft move the user accounts to Microsoft services? Are there any 2FA authenticator app available for N9? Jim, 03 Jun 2015TO ALL N9 USERS: we cant access OVI store anymore, and we cant create new account to download ... moreThanks a lot man! TO ALL N9 USERS: we cant access OVI store anymore, and we cant create new account to download stuff, there is simple solution: https://openrepos.net/ , you can find every application you need there, they are all backed up, and you can download them straight to the phone and install it (I m using filebox and flashlight, but there are a lot of different ones, probably the one most of you will be interested in is whatsup app). We cannot sync Google account anymore, due to some changes, but you can still have your google mail account syncing via other mail account in accounts menu in N9, yes we lose gtalk, but you can still use mail. There are some solutions for gtalk, it includes installing jabber, I dont know i didnt tried it because i dont use gtalk a lot. For those complaining about maps and drive not working without Nokia Account, there is simple solution for that too. http://talk.maemo.org/showthread.php?s=4246e2299­d1c927efe31889fba882224&t=95493&page=4 visit the site and follow the links and instructions to get maps and drive back, it took me under 20 minutes from clearing the device to getting everything up and running. 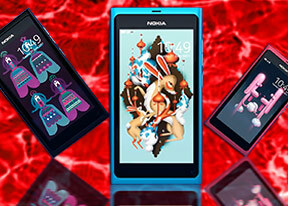 So there you have it, Nokia N9, they try to kill it, community brings it back to life. I can still check my emails, use navigation, and everything else, as the day it was launched. I had to share this, because i had to clear the device, and was thinking of replacing it, but now no, i have everything i need in a phone. Long live N9. battery its ok but i had problem with facebook messenger .I decided to reset my phone.After reset had big issue!Its not possible to login in facebook ,google,nokia acount,store,maps,drive as well.only Skype work fine.Writing-service not available!WTF? My apps store not working,When I connect to internet for app store loading ,any time displayed "There was a problem this page.It could be lost connection or a slow network.Check your connection or try again later" But my internet connection good & network fast, Pls help me, How to load my N9 apps store? jim, 25 Apr 2015Just a WARNING TO ALL N9 USERS dont clear your device, you will lose all apps you have downloa... moreYes thats right.. I tried also opening the store but it always says that connection is not available..
Just a WARNING TO ALL N9 USERS dont clear your device, you will lose all apps you have downloaded, I tried to open Store on my phone and it says that page is unavailable, same thing with my downloads. well meego os feels natural... swipe down to close swipe left or right or from the bottom go back to homescreen. double tap to unlock the n9 ( now lollipop copied this feature!!)... and this os is Superb and amazingly modern and timeless just look at the three main home screen. feed( shows notification and social updates status from the home screen) application and multitasking view/screen (view the open or running application on the background, the running app showed in card that can be zoomed in or out).... i love how to unlocked the lockscreen.... JUST A SWIPE AWAY... the haptic feedback from the keyboard sounds, interacting with the homescreen or closing an app is realistic enough that u can tell what sounds to closing an app :) The sqircle ( square + circle) design intergrate within the meego OS and become its trademark... beautifully simple both hardware and software.. you will discover its magic if u own this phone..